In the back corner of the Fringe Club lies an enchanted crackhouse. Hand the creative reins of Fred Penner’s Place over to Seth Macfarlane, and you’ll get a rough approximation of the Enchanted Collective’s inventive, sometimes cringe-worthy work of genius. The play stars Virginia (Kristin Mueller-Heaslip), a virtuous young woman with the innocence and vocal chords of a seasoned soprano, on a quest to rescue her sister – “Well, she’s my twin sister, only she’s a prostitute addicted to crack” – from the clutches of the Kralk (Daniel Krolik), a greaseball human-rodent hybrid. Even more enchanting than the crack house itself are the oddball rogues and rodents within it. The play is overrun by a crew of lecherous puppets. Mueller-Keaslip is adorable, and watching her descend into the house’s gritty depths is a lesson in organic character development. Dialogue – whether spoken or sung – is consistently spot-on. Watch for a bevy of foolproof one-liners – “judge me on the content of my character, not on the diseases I may carry.” Cheer on Mueller-Keaslip as she tries to “Ford the Fjord,” one of many hilarious musical numbers led by the Crackhouse Band (Production Manager Sky Shaver and Co-Creator Hillary Thomson). An expert cast of performers – actors, puppeteers, improv artists, musicians – build this brand of offbeat humour toward a satisfying end. Don’t let the crack-addicted puppets fool you: this is smart play. Whether you bring your own booze or not, no Fringe experience is complete without a trip to The Enchanted Crackhouse (just don’t bring your kids). 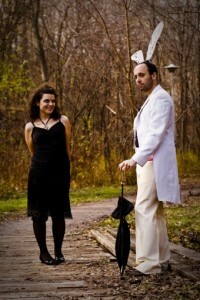 The Enchanted Crackhouse is an AlleyPlay staged in the Fringe Club at Honest Ed’s 581 Bloor Street West. Admittance to all AlleyPlays is on a “Pay What You Can” basis – advance tickets are not available.